Recognizing how common it is for crafters to start many projects and finish few, a group of women join together to form a guild-Unfinished Projects Anonymous-to keep each other on track and accountable. Three of the friends are tasked with the job of home visits for their guild. Laughingly called "the Cartel," they snoop around craft rooms and knitting baskets to report on progress for the members. They even expand their mission to include checking on half-trained dogs and half-weeded gardens. 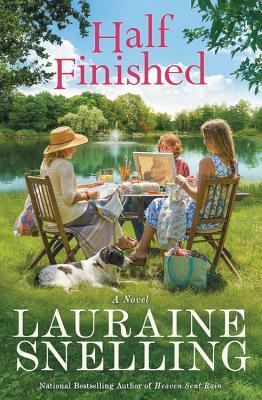 As life unexpectedly changes for one of the members, this ensemble of women in bestselling author Lauraine Snelling's new novel discovers that much of life is half-finished-projects, friendships, the raising of children, even our very relationship with the Lord. And that may be perfectly fine. LAURAINE SNELLING has been writing since 1980, with over 65 books published, both fiction and non-fiction, historical and contemporary, for adults and young readers. She received a Career Achievement Award for inspirational fiction from RT Book Reviews and her books consistently appear on CBA bestseller lists. A hallmark of her style is writing about real issues within a compelling story. Lauraine and her husband, Wayne, have two grown sons and live in the Tehachapi Mountains in California with a Bassett named Sir Winston.